LYNX Rapid APC Antibody Conjugation Kit (LNK032APC) used for the conjugation of anti VAP-1 antibody to allophycocyanin for subsequent detection of VAP-1 in colon tissues by immunofluorescence. From: Ward ST, Weston CJ, Shepherd EL, Hejmadi R, Ismail T, Adams DH. 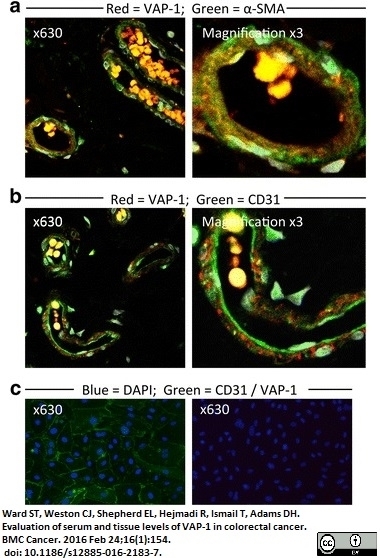 Evaluation of serum and tissue levels of VAP-1 in colorectal cancer. BMC Cancer. 2016 Feb 24;16(1):154. LYNX Rapid APC Antibody Conjugation Kit® enables the rapid conjugation of a pre-prepared lyophilized mixture containing Allophycocyanin (APC) label to an antibody or protein. Activation of proprietary reagents within the antibody-label solution results in directional covalent bonding of APC to the antibody. For optimal results the antibody should be at a concentration of 1mg/ml, with a maximum volume of 10ul and a maximum antibody amount of 10ug. Antibody at a concentration of greater than 1mg/ml requires dilution. Antibody below 1mg/ml can still be used as long as the maximum volume is not exceeded. Using less than the recommended amount of antibody may result in unbound label, but this will be removed during subsequent application wash steps. Antibody below 0.5mg/ml should be concentrated before use with the kit. For optimal results the antibody should be at a concentration of 1mg/ml, with a maximum volume of 100ul and a maximum antibody amount of 100ug. Antibody at a concentration of greater than 1mg/ml requires dilution. Antibody below 1mg/ml can still be used as long as the maximum volume is not exceeded. Using less than the recommended amount of antibody may result in unbound label, but this will be removed during subsequent application wash steps. Antibody below 0.5mg/ml should be concentrated before use with the kit. For optimal results the antibody should be at a concentration of 1mg/ml, with a maximum volume of 1ml and a maximum antibody amount of 1mg. Antibody at a concentration of greater than 1mg/ml requires dilution. Antibody below 1mg/ml can still be used as long as the maximum volume is not exceeded. Using less than the recommended amount of antibody may result in unbound label, but this will be removed during subsequent application wash steps. Antibody below 0.5mg/ml should be concentrated before use with the kit. Paget, C. et al. (2012) Interleukin-22 is produced by invariant natural killer T lymphocytes during influenza A virus infection: potential role in protection against lung epithelial damage. J Biol Chem. 287: 8816-29. Seliger, C. et al. (2011) A rapid high-precision flow cytometry based technique for total white blood cell counting in chickens. Vet Immunol Immunopathol. 145: 86-99. Fu, Y. et al. (2014) Development of a FACS-based assay for evaluating antiviral potency of compound in dengue infected peripheral blood mononuclear cells. J Virol Methods. 196: 18-24. Wielgosz, M.M. et al. (2015) Generation of a lentiviral vector producer cell clone for human Wiskott-Aldrich syndrome gene therapy. Mol Ther Methods Clin Dev. 2: 14063. Poh, C.M. et al. (2014) Damage to the blood-brain barrier during experimental cerebral malaria results from synergistic effects of CD8+ T cells with different specificities. Hasenhindl, C. et al. (2014) Creating stable stem regions for loop elongation in Fcabs - insights from combining yeast surface display, in silico loop reconstruction and molecular dynamics simulations. Ward, S.T. et al. (2016) Evaluation of serum and tissue levels of VAP-1 in colorectal cancer. BMC Cancer. 16 (1): 154. Schuh, C.M. et al. (2016) Covalent binding of placental derived proteins to silk fibroin improves schwann cell adhesion and proliferation. J Mater Sci Mater Med. 27 (12): 188.